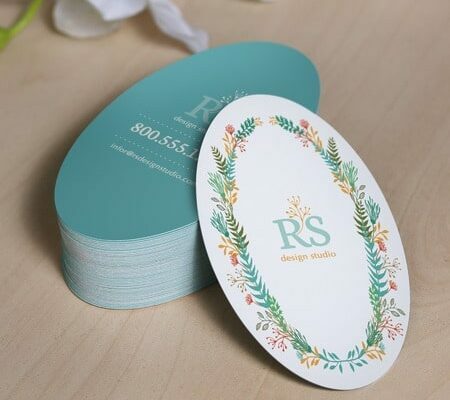 Make a great first impression with oval business cards, These cards are classy and unique, making them attractive and captivating. We are the best manufacturer of Oval Business Cards Printing Service in Delhi and NCR. Include key business details on your cards such as contact, address and logo. You can also use the back for your products or services as a discount coupon. Custom business cards are a powerful tool for your business promotion. Maximize them and ensure that your customers receive the correct message. You can also start with one of our business card templates. If you have your artwork ready for printing, you can just upload you printable file for batter quality printing. Our oval business cards are printed in thick and durable & Thick Paper. Give your business cards a perfect shape and emerge from the group with oval business cards. With the extraordinary shape making them more attractive, these oval-molded business cards will pass on a solid message to your clients. These cards are prominent for structure studios, mold related organizations, craftsmen, and magnificence salons. You can select one of the options for coating. You have a matte coating with a more subtle shine and a really glossy UV coating. If you want something in the middle, choose gloss coating. Oval business card printing can change the way your business cards are presented.